In this video Ableton Live Certified Trainer Will Doggett shows you how you can connect your iPad running Playback or your computer running Ableton Live, to your Soundboard. You'll see the settings you'll need to configure to use an interface with Ableton Live and how to use an audio interface to send Multiple Outputs from Ableton Live. 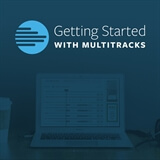 In this Course, Will Doggett will take you through the basics you need to know to get started with using MultiTracks.